Hands up how many of you have had, have or will have a digitalization vision or premonition? For many that lie in the future but let’s say anything “e” in doing business? Anything electronic supporting business transactions, processes and ways of doing business is not new anymore yet reaching those visions may still prove to be a challenge. 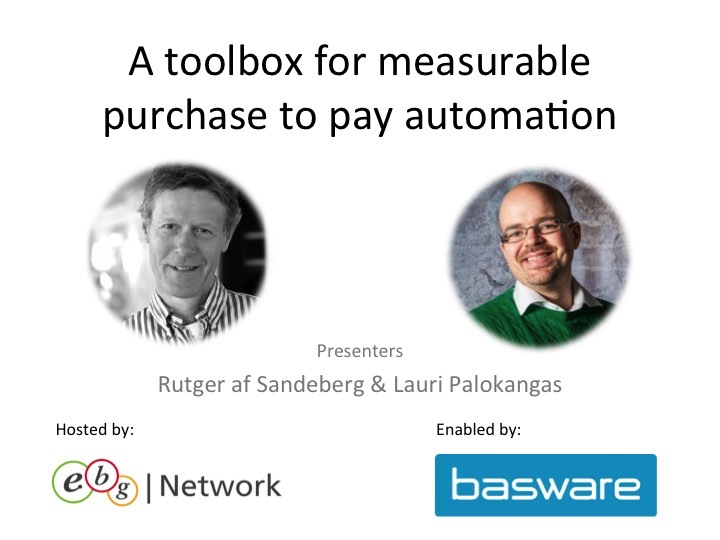 EBG | Network teamed up with Lauri Palokankas at Basware to do a webinar with a to-the-point focus on how to “do” purchase to pay from an end user perspective. Is there a need for a P2P vision? Do you have to decide on a P2P scope? How do you decide what KPIs to use to measure performance? How do you calculate the P2P business case? How do you implement in accordance to the above? Rutger af Sandeberg came to our aid and shared his years of experience working at Scania with P2P business development in a global environment. In the below recorded webinar he share how they set up the above requirements and how they follow it up. EBG | Network are happy that Rutger took part in one of our Source 2 Pay Summits and got the basic ideas for how Scania since then have been following up on P2P success. Hearing that enabling peer to peer interaction really can make a difference makes EBG very proud! It can be easy to loose sight over the wood due to all the trees i.e the digitalization going on and being spoken about serve many purposes of which one is increasing overall business visibility. What if you could base your forecasts and reports on real time data and insights? Or at least combined facts. 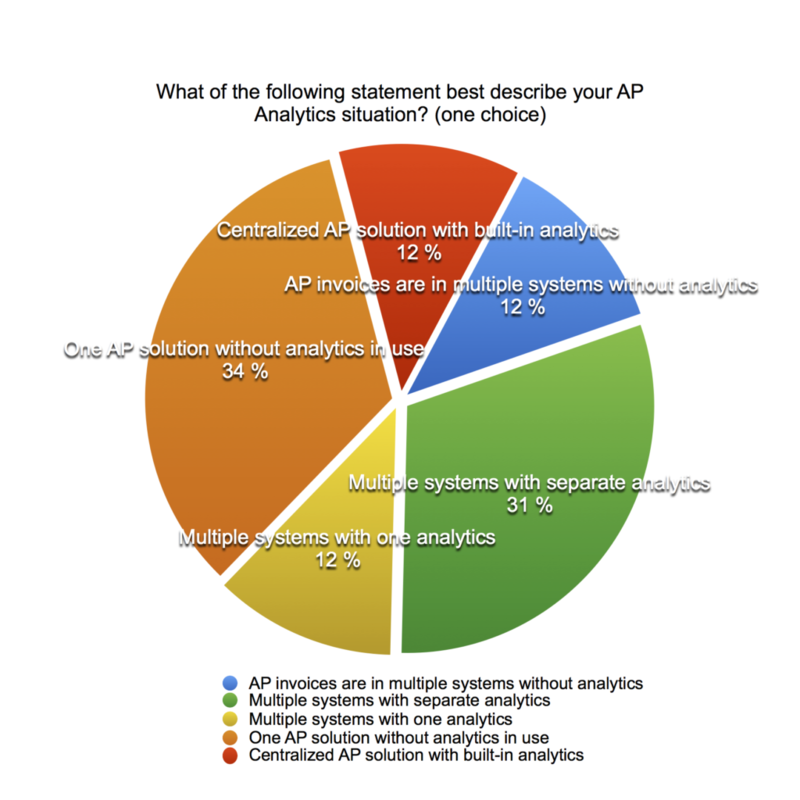 Most companies have an accounts payable system – many have several – and with a poll question EBG asked how the current AP analytics status was best described. As usual there are no right or wrong – there can be any number of reasons for not centralizing with one analytics. It is how ever fair to say 77% of the respondents lack One view over accounts payable facts from an analytics perspective (we know excel is still queen). Secondly – following the introduction of the P2P road map – a question about what was perceived as most challenging was launched. Calculating the business case (40%) and how to implement systems, processes and metrics (53%) are most challenging according to the respondents. The obvious question to ask before would have been if there is a P2P vision, a P2P scope and KPIs chosen. In any case the answers are a shout out to system providers and consultants to help support businesses with a 360 ROI structure. The final poll question was about metrics. Again the obvious question before the above may have been what priorities the respondents have but one would assume they correlate. The best practice holy grail is the 3-way match (see a session about goods receipt here) where contracts, catalogues, punch outs, what ever, orders, GR and invoices are aligned and automatically pushed through a system. 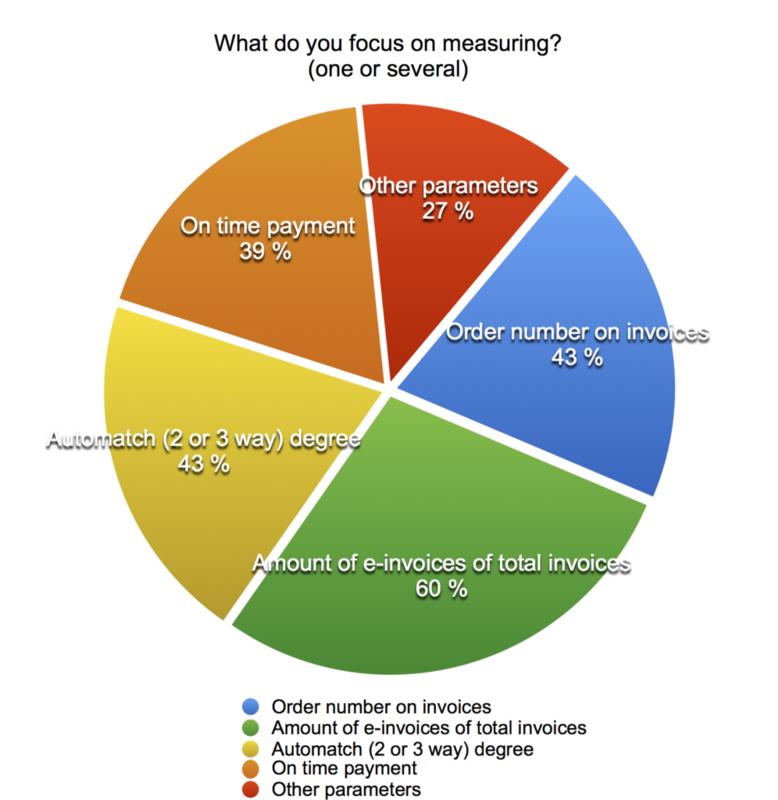 The “other parameters” were (when asking respondents to sign in in the control panel) were metric such as Invoice process cycle time and DPO, Number of scanned invoices with reference (not order no. ), PO auto creation, Invoice exception rate and so on. What does you P2P vision look like? Do you have a P2P scope? What is your P2P business case and do you have an end-to-end, 360 view over your spend, costs and cash flows?